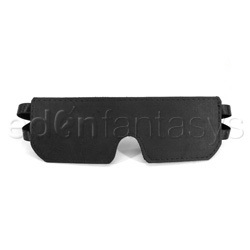 ﻿ Fleece blindfold - headgear reviews on EdenFantasys. Except for the small issue of this mask making you look like a football player wearing eye black, this is a great mask! This blindfold was my first foray into sensory deprivation during kink, and while I am still not a fan of having one of my senses taken away, I'm definitely a fan of this blindfold. Well, at least when used on others. It's fairly well made, has held up to several intense scenes, and apart from creases across the bridge of the nose, has no other signs of the abuse I put it through! Great accessory to add to the toy chest. Works great for sensory deprivation, is well-made, and can double as a sleeping mask.